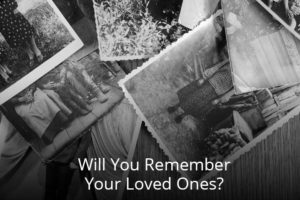 Will You Remember Your Loved Ones? In heaven, how will we be joyful knowing some of our loved ones are in hell? “I would make the remembrance of them to cease from among men” (Deut. 32:26). “His remembrance shall perish from the earth” (Job 18:17). “I am forgotten as a dead man out of mind” (Ps. 31:12). “To cut off the remembrance of them from the earth” (Ps. 34:16). “ . . . land of forgetfulness” (Ps. 88:12). “He may cut off the memory of them from the earth” (Ps. 109:15). “The name of the wicked shall rot” (Prov. 10:7). “They are dead . . . therefore hast thou visited and destroyed them, and made all their memory to perish” (Isa. 26:14). Revelation 21:4 states, “And God shall wipe away all tears from their eyes; and there shall be no more death, neither sorrow, nor crying, neither shall there be any more pain: for the former things are passed away.” Revelation 7:17 and Isaiah 25:8 say the same. It appears from these verses that God will erase the pain of the past, the things that would cause sadness, and remove them from our minds. Those former things are “passed away.” There is a verse that states the Word is able to divide soul and spirit (Heb. 4:12). God is well able to separate joy and sadness from our hearts and minds. This answer may not be conclusive, as there may be more to this than is revealed in Scripture. There are some things we will not fully understand until we are in heaven. God Has Not Changed →← How Do I Vote in the Election?